Frequent use of your cookware, especially the stainless steel ones, will make their shine fade. They even can turn black, and every housewife can tell how hard is to rub a burnt pan. And the result after harsh rubbing is pretty ugly, making your cookware look horrible. 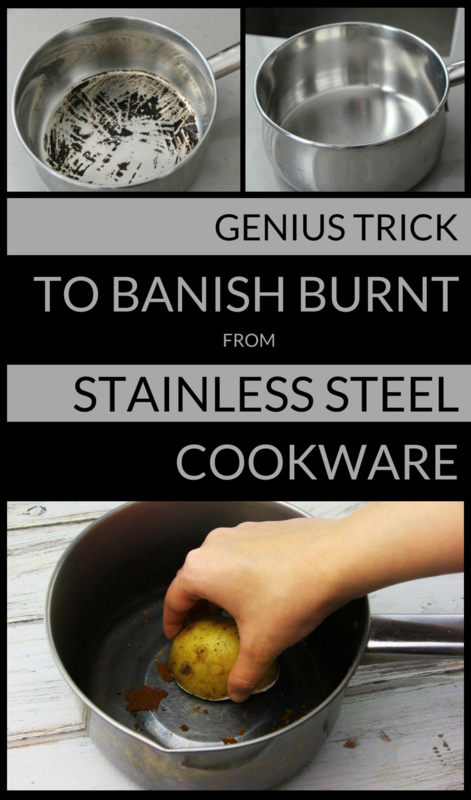 If you are looking for better solutions to clean your stainless steel cookware, and you don’t want to use chemicals, I found the best solution for you. Cheap and I bet you have it in your kitchen already. How to clean your burnt cookware? Take a potato, cut it in half and soak it in baking soda. Then, start rubbing the pan with the potato. Repeat the procedure until the burnt is gone, and your pan is clean. Soak the potato in baking soda from time to time. Specialists say potato juice, in combination with baking soda, is very effective in dissolving burns! Tip: This trick is great to use for all your cookware, even ceramic ones.